Ruth St.Denis (1879-1968)., the Mother of Modern Dance in America-later married Ted Shawn and formed the famous dance company Denishawn which trained other famous dancers as Martha Graham and Pearl Wheeler. St.Denis was actually an “interpretative dancer ,believing in the principle that behind each physical gesture was an emotional and spiritual motivation. Nature was her model for her movements which were expressive and dynamic. St.Denis contributed much to modern dance- the use of bare feet, freer use of torso, subtle modulations of weight ,gradation in dynamics and expressive use of hands. Several years back, when my beloved elder sister,Mrs.Basilia Rojas Escopin was still alive, she kept a book about Ruth St.Denis.She too was a dancer and a very good one if I may say so. She took inspiration for her creations through Ms.St.Denis. So I stole this particular book, not reading the entire contents at once, but perusing the pictures first . 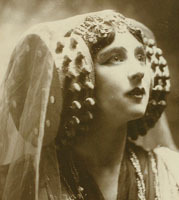 There Ruth St.Denis danced through the ages, stilled only by photography and the passage of time. She incorporated Eastern influences in her dances like Radha from India,Kuan Yin from China, and Egypta from Egypt Other dances were Second Arabesque, Soaring and Sonata Pathetique. She traveled around the world with her husband Ted and the Denishawn dancers. She is not only a dancer but a poet as well..
For that is why I dance. Source: Shelton ,Suzanne. DIVINE DANCER.Doubleday & Co.,Inc.,New York,USA.1981.